Some readers may wondering why I capitalize the Estate? Well…… Because I want to put an emphasize on it as a place? Anyway, enjoy the chapter. Lieze on the attack, btw. While viewing the appearance of the just recently completed waterwheel steadily scooping the water up, Kazura checked the waterwheel rotational speed. Every guard and servant that followed Kazura once more experienced assembling the waterwheel and constructing aqueduct just like yesterday. Because of this, the work was able to progress much smoothly than yesterday. At this rate, they could install three or four more waterwheels by today. Different from the waterwheel that he checked yesterday with Zirconia, the assembled waterwheel this time had almost regular rotational speed. Zirconia had said that she commissioned the manufacturing of the parts to the craftsmen in the city, so perhaps there was a workshop amongst them that have a problem in the manufacturing precision. Since there was no mark to indicate which workshop manufacture which parts, the entire waterwheel had become a jumbled mess of parts of different workshops. In the future, there was a need to put some kind of the manufacturing workshop’s brand on every single part. With a dumbfounded expression, Lieze looked up at the waterwheel that was continuously ejecting mass of water into the aqueduct. While looking at the waterwheel that continued turning round and round, Lieze threw a suitable reply. Even though Kazura had said a defect, she couldn’t imagine what kind of flaw which could happen, so she didn’t ask about this any further. Since the waterwheel that relentlessly spraying mist while rotating had such impressiveness that overwhelmed her, she might be too preoccupied to even think about a question. When Kazura said so, he gave an order to the nearby servants who was resting while looking at the waterwheel to prepare the lunch. The servants made a light reply and then ran towards the horse wagon, taking collapsible simple tables and chairs from inside it and began to skillfully assemble it. In a matter of several minutes, they had finished a table with a parasol and seats, just like a terrace café in the Japan. The simple table had a hole in the middle of it so that it could be inserted with a parasol. The parasol that was used for it was the parasol that had been used by the servants to shade Kazura and Lieze until now. The finished table was covered with a tablecloth, where silver plates and cups were lined up. On top of them was the cooked food that had been brought from the Estate, and so the lunch preparation was instantly completed. The dishes served on Lieze’s plates were a lightly baked pancake, pickled chicken with herbs, thin slices of plum-like fruit, and diluted fruit wine. It was something that he had thought when he traveled together with Isaac’s unit before, it seems that it’s normal in this world to even drink alcohol for a daytime meal. For a fruit wine to be served to a girl like Lieze, there might be no age limit in consuming alcohol. As usual, Kazura’s portion meal was canned food, this too had been loaded in the wagon. When the tableware for kazura had been finished lined up, Marie went to the wagon and picked up the canned food from its cloth package. While still being concealed by the cloth, she pulled out the pull tab of the canned food and then left the opened lid at that place. Then while covering the canned food exterior with a cloth she returned once more to the table, and after giving bow she carefully began to transfer its contents to the plate. The canned food that Kazura brought this time was clam chowder and sweetened bun. 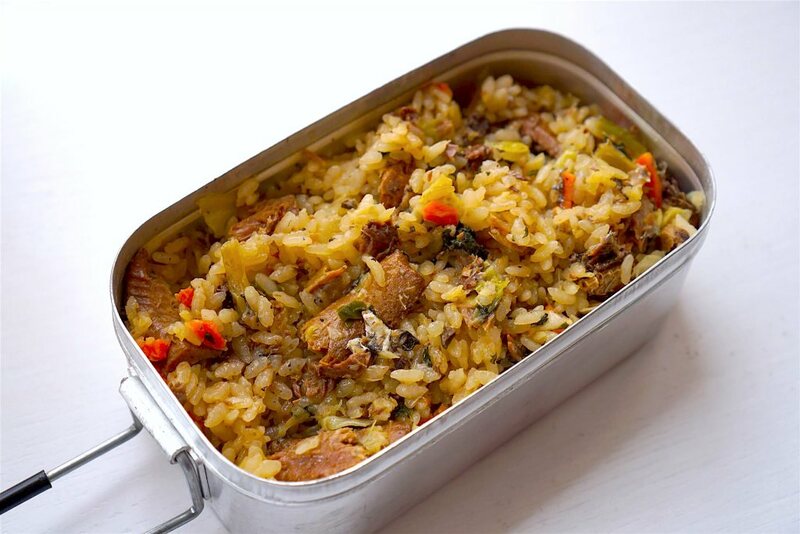 Actually, he wanted to bring a mixed rice meal canned food, but a rice meal canned food will need to be heated adequately with hot water, so he abandoned his intention. The beverage that was poured into Kazura’s cup is not a fruit wine but plain water. By the way, Marie opened the canned food’s lid without being seen by other people, was because previously Havel had instructed her to do so. Lieze made a glance at the clam chowder that was transferred from the can into the silver plate. Because Lieze still didn’t know about the existence of canned food, she thought that it was a previously made stew that was brought straight from the Estate. Under the heat of the sun like this, if the stew was left inside the wagon for many hours, then although it won’t rot, normally it would become somewhat stale. When Kazura said so, Marie made a rather surprised expression. She made a bow and then walked towards the wagon to eat her lunch. Perhaps she was following Kazura’s example, Lieze also ordered the servants and guards that were waiting beside her to have a break. The servants made a bit grateful reply, before greeting Marie who was fetching the meal from the wagon, then everyone sat down together at the riverbank and began to eat their meal. The servants seem to be immensely curious about Marie, so they were talking one thing and another with her. Although the content of the talks couldn’t be heard from Kazura and Lieze’s location, since it looks peaceful there shouldn’t be any problem. When Kazura put his spoon at the clam chowder and thought ‘Let’s eat’, Lieze pushed her plate a bit forward and offered it to Kazura. Because Lieze was offering it, Kazura stabbed a piece of meat with his fork and put it into his mouth. The meat seems to be the thigh one, the salt had sufficiently tenderized it, the herb scent gave it a good accent, the seasonings brought out its taste and so it was extremely delicious. Lieze sweetly smiled at Kazura who made a wide smile at the taste of the meat inside his mouth. Lieze hurriedly stopped Kazura who stood up from his seat and going to retrieve a plate from the wagon as he wanted to offer his clam chowder in return. But to tell the truth, Lieze was offering her own dishes to Kazura because she was worried that the clam chowder that Kazura wanted to eat had gone stale. The reason why she said, “We have prepared a large amount of it”, when she was offering her dishes previously and said that it was delicious, was so that even if by any chance that the dish that Kazura brought had gone stale, it will be easier for Kazura to eat Lieze’s dishes. Since Kazura will lose face if she said that the dish had gone stale, Lieze took this precaution so that wouldn’t happen. Then if Kazura put his own dish into his mouth and noticed that it had gone stale, he would notice Lieze’s consideration. If this happened, then his favorable impression to Lieze will surely go up, hence Lieze was hoping inside her heart that the dish was stale. While completely oblivious about Lieze’s intention, Kazura began to eat the clam chowder. Of course, the clam chowder that was just been opened from its can surely haven’t gone stale yet, and so without any particular change in his expression, Kazura tear the bread placed on the plate and ate it with the clam chowder. Seeing that Kazura was fine, Lieze was a bit dejected inside her heart, but without letting this shown up on her face, she nodded at Kazura’s proposal with a smile. 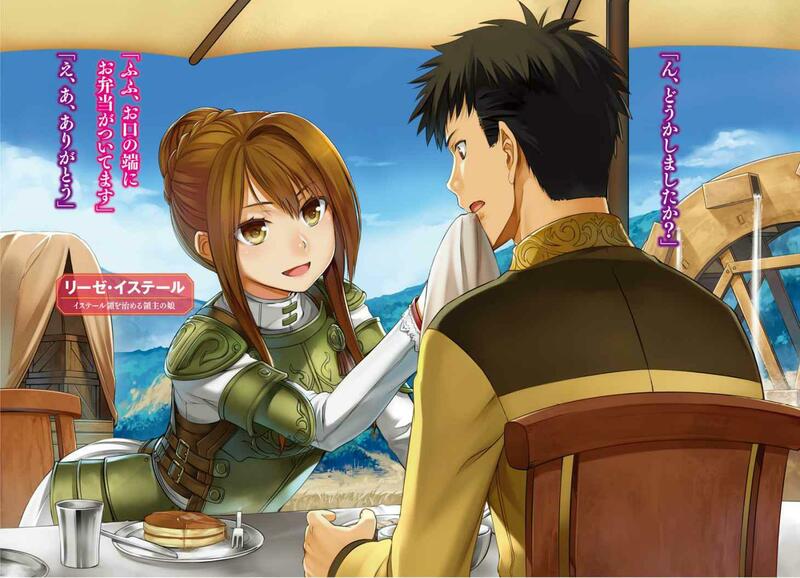 Since it was not particularly necessary that she had to increase his favorability to her immediately, Kazura had already looked considerably interested in her. Seeing that Kazura will be still staying in the Estate for quite a time, it will be alright for her to attract his favor slowly next time. 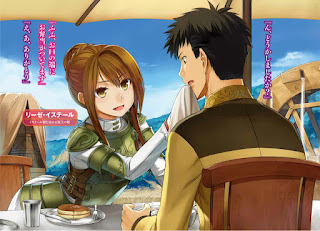 While they were eating and taking turns chatting, Lieze was thinking about what to do with Kazura in the future. If the content of the conjecture she had together with Eira this morning was correct, then Zirconia should have made various necessary arrangements so that she and Kazura will do things together in the future. Her lack of information about Kazura’s origin made her a bit curious, but even if the great noble identity was a lie to make Lieze interested and he was really only a common citizen of Claylatz, the fact that he should be a very rich person didn’t change. The problem wasn’t whether or not he was a noble, as what Lieze highly concerned was the influence and assets that Kazura possessed, and then more than anything else, how generous he is with his money. A person that Zirconia recommended shouldn’t be someone with a weird background and if he someone who is that close to Nelson that even Nelson was relying on him, there should be no problem with his personality either. Lieze’s impression of Kazura she gained from her observation of him during these few days, was that Kazura was someone that was polite to everybody and had consideration for others, furthermore, he was quite a hardworking person. And yet despite all that, he was really generous to give that expensive pendant as a present without any apprehension. Although it might only be that he was not feeling any regret when he needs to spend money, but he didn’t seem to have the same complete self-restraint awareness like Nelson or Isaac. He was very close with Nelson and Zirconia, that he was even invited to the family dinner, someone that wouldn’t be a problem to be a marriage partner. Because of her appearance, Lieze was accustomed to the males eyeing on her since long time ago, so it’s not to the extent that she was particularly disgusted by it. She only rationalized that perhaps men are such a creature, but since she realized when she was being looked at if the stare was excessively sticky at her, it felt gross. In that point, although Kazura also sometimes staring at her, when she noticed it, he would remove his sight away, and it felt that as if he was being careful not to deliberately staring at her. Amongst the males who usually came in contact with Lieze, it was rather rare for a male to take such an attitude, thus Lieze had a good impression on him. By the way, although Isaac had the same cautious sight just like Kazura, Lieze didn’t pay him any mind. Suddenly Kazura noticed that Lieze was looking at him, and so he tilted his head. With these words, Lieze took up the napkin placed at the table and then while bending herself a bit, she gently wiped the corner of Kazura’s mouth. While blushing, Kazura thanked her. Lieze smiled at him while inside her heart she muttered. An example of Mazegohan in Indonesia cuisine will be Nasi Goreng (yummy) or Nasi Campur (Kaifon in Khek Chinese). Also, nasi goreng? I don't think that's right, since nasi goreng is cooked first plainly... Unless I'm guessing wrong would not mazegohan more like pilaf or risotto, rice cooked with ingredients form beras state, instead cooked with ingredients from nasi state like nasi goreng? I think the indonesian example my mother once mention is nasi kebuli. Uncooked Rice (beras) + stuffs + water = it's takikomi gohan 炊き込みご飯, like nasi uduk, nasi kuning or nasi kebuli, etc. Cooked Rice (nasi) + stuffs = it's mazegohan 混ぜご飯, like nasi campur, etc. Since Nasi Goreng used cooked rice and a lot of stuffs, it's can be called as some form of mazegohan (although mazegohan didn't 'recook' the cooked rice). if cooked in 'beras' state it would be takikomi gohan.